Interested in interviewing Larry Kelley? We have provided the information and past appearances below to assist you. 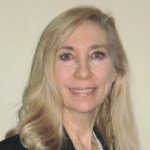 For article publication visit Larry Kelley’s Published Articles page. Larry Kelley and John B. Wells were reunited 4/12/17 to discuss current developments with the Carl Vinson, Arliegh Burke-class guided missile destroyers and Ticonderoga-class guide missile cruisers which are making their way to North Korea. Larry Kelley hit the airwaves March 29, 2016 to talk with Dr. Drew and Mike Catherwood. Larry Kelley talks with Jake Tapper about journalists being targeted by terrorists and the Molly Norris Foundation. Listen to Larry Kelley’s multiple appearances on Coast to Coast AM with John B. Wells. All without the commercials and news breaks. It is a riveting interview focusing on why great civilizations fail and what that means to you. In the latest appearance (9-21-2013), Larry takes caller questions. Larry is burning up the radio waves both online and over the air! His latest interview answers some hard hitting questions from the host, Danielle Hampson. The Author’s Show is an online outlet to highlight author’s who are marketing and promoting their hard work and dedication to the written word. Larry’s book stands out as a masterfully written political commentary based on historical facts. This interview is quick and to the point with a no-nonsense approach to Larry’s book, Lessons From Fallen Civilizations. So sit back, hit play and enjoy the interview. Listen to the August 11, 2013 Interview with Larry Kelley as the discussion unfolds about the Islamic influence in America and how it relates to Larry’s book “Lessons From Fallen Civilizations“. Be sure to also check out our friend Barry Curtis online at The Curtis Report by clicking the link to his site. 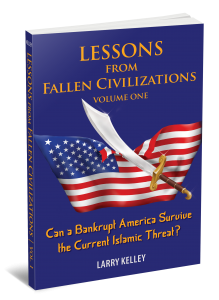 Listen to the January 30, 2013 Interview with Larry Kelley as the discussion unfolds about the Islamic influence in America and how it relates to Larry’s book “Lessons From Fallen Civilizations“. 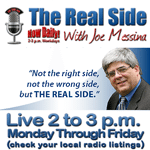 Be sure to also check out our friend Joe Messina online at The Real Side by clicking the link to his site. Listen to Larry Kelley’s interview on IStook Live from November 15, 2012. Ernest Istook is a former congressional member and considers himself in recovery after serving 14 years. This poignant interview gets the topic rolling on the state of our nation through the historical lens. Listen Now. List to the interview from Oct 23, 2012. Larry Kelley’s segment is about 47% in. What fallen civilization is the US most like? And why? European Rome disappeared in 476 AD. The parallels between Rome and the US are many. How is America in decline? 70% of Americans tell pollsters they believe the country is headed in the wrong direction, a euphemism for decline. What is the significance of President Trump’s election? President Trump is an unknown political entity and that is an important advantage in countering our adversaries. What are your Immutable and which are in play in the US now? They are undermining factors and bad decisions which can be seen to repeat over time in the fall of great civilizations. Immutable #7: With the loss of fiscal solvency comes the loss of sovereignty is at play. The US is now encumbered by $200 trillion in unfunded liabilities. Should all immigrants from predominately Muslim countries be banned from coming to the US? Certainly not. There are many Muslims living in Iraq and Afghanistan who, for example, have acted as interpreters during those theaters of war. If they are now afraid for their safety, they should be allowed entry to the US. We should welcome Christians and minorities who fear for their safety as well. What countries comprise the “New Axis of Evil” and what threat do they present? Iran, North Korea, Russia and China. The threat is existential. How might Iran destroy the US? They are close to acquiring an EMP (electro-magnetic pulse) weapon capable of crippling our electric grid and render our entire infrastructure inoperable. What are the solutions we can implement now to reverse American decline before it’s too late. 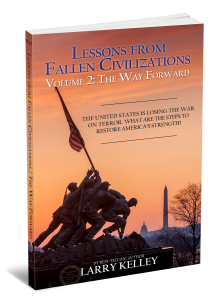 In Lessons from Fallen Civilizations, Volume 2, I outline the “Winning Agenda” which is 12 things we can do right now to change the decline of the West and begin to defeat the Axis of Evil. Why should America offer sanctuary to female Islamic apostates? Doing so would accelerate the much-needed Islamic reformation, which has already begun. Interested in an interview? Download Larry Kelley’s Media Kit here.